Ultimately, this is all about celebrating innovation and inspiring people to engage in invention and electronics. SparkFun Electronics, a provider of electronics parts and educational tutorials, is pleased to announce that team registration is now open for the legendary Autonomous Vehicle Competition (AVC), which, for the first time, will also include a course for the Power Racing Series (PRS) and, for the second year, will feature an arena for Combat Bots. 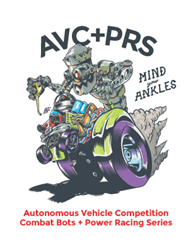 Autonomous Power Racing Series (A+PRS): Combination AVC and PRS. Bonus points for having a human on board an autonomous souped-up power wheels. These competitions are open to the public—general admission tickets will be available soon. In addition to the races, there will be food trucks, music, SparkFun tours, expert speakers, and an engineering corner.